Irish Genealogy Toolkit has published a new edition e-book providing brief details of all the brand-new and upgraded Irish genealogy records released in the eight years from January 2011 to March 2019. It's been a golden period for Irish family historians, with new records appearing online almost every week. No researcher is going to complain about that, but keeping up with such a pace of delivery can be demanding. This booklet is an update of the editions published in 2014, 2015 and 2017. In order to keep the overall pdf size at a manageable size, I've condensed the text of some of the original entries and reduced the size of pictures to some extent. Other than these changes, the e-book is pretty much unaltered in design and layout, which feedback tells me was suitably easy to work around. As previously, I can't guarantee that I've included each and every record release during the eight years, but I think I've caught most in my net. All of the collections featured in the e-booklet were the subject of posts on my blog Irish Genealogy News at the time of their release. 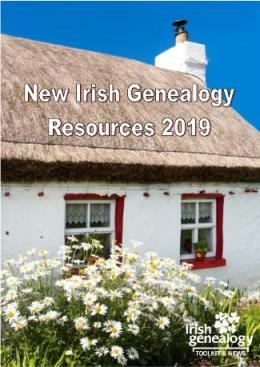 New Irish Genealogy Resources 2019 won't tell you what to do with all these new toys (it's not a 'how-to' guide... this website does that job!). It simply sets out all the new, mainly online, records at your disposal. 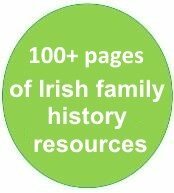 It's arranged by type of resource ie Census, Newspapers, Military Records etc, and also county-by-county, becoming a handy aide-memoire of recently-available resources useful to Irish family historians. Take a look at this free 7-page sample (2Mb) from the 2011-2015 ebooklet. The 2019 edition is a 102-page e-booklet and is available as a pdf download (it's just under 8Mb). As previously, I can't guarantee that I've included every record release during the eight years, but I think I've caught most in my net. All of the featured collections were the subject of posts on my blog Irish Genealogy News at the time of their release. The 2019 edition is a 102-page e-booklet and is available as a pdf download (under 8Mb). 3. Save the file to your device, and enjoy the e-book. Just click one of the Buy Now buttons below to be offered a choice of safe payment methods in your preferred currency. Are you keen to start researching your Irish family history and heritage? Jump straight in at the Get Started page.